Recent recordings from Mariss Jansons have been a mixed bag. There have been many releases on the own labels of his two orchestras, the Bavarian Radio Symphony and the Concertgebouw, some excellent, others less so. He always gives well-controlled and finely crafted performances, which are certainly virtues, but they separate him from the younger generation of conductors with whom he competes in the core repertoire. Their key qualities - excitement, dynamism, unpredictability – are notably absent from his more measured accounts. That can be fatal in his Shostakovich and Mahler, and it is a mixed blessing in his Bruckner (his Seventh was good but his Sixth plodded). Fortunately, the one composer for whom Jansons never fails is Brahms. 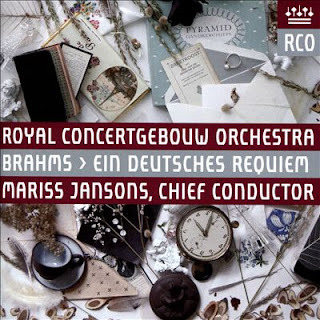 His Second and Third Symphonies with the BRSO has been one of the finest releases from their label, and was followed by a First and Fourth that were well regarded, as was the Second Symphony on the Concertgebouw label (RCO 05002). The sheer craftsmanship and elegance of Jansons’ approach perfectly aligns with Brahms’ lyrical but always highly intelligent Romanticism. Jansons never goes to extremes, of tempo or dynamic, but then Brahms never calls for them. Instead, the focus is always on creating flow and line, but within clearly delineated and elegantly proportioned structures. And, his moderation aside, there is always drama in Jansons’ Brahms, and never any feeling that his sophistication is diminishing the emotional experience. All of which bodes well for this German Requiem, and the recording certainly lives up to expectations. It is taken from live performances in September 2012, and the reasons for the delay in its release are unclear. But it was worth the wait, as this is an involving and compelling account. Tempos, as ever with Jansons, are midrange and steady, which, when combined with the plush sound the Concertgebouw Orchestra makes for an ideal sense of solemnity. The SACD audio (heard in stereo) is good, and, as so often with this label, is used to intensify the atmosphere rather than focus in on the details. The result, from orchestra and chorus alike, is a warm and rich tone, expansive at the tuttis and always suitably consoling. Gerald Finley, listed here as a bass, is in fine form. He brings valuable operatic qualities to his solos, but keeps that trademark expression and depth of emotion in line with Jansons’ reading, the focal point of the music, but never the standout star. Genia Kühmeier seems less emotionally engaged, but the purity of her tone is very attractive. Hers is a fine performance, but it’s not in the same league as Finley’s. The performances of both soloists feel integral to the ensemble, and to the performance as a whole. Perhaps the Concertgebouw acoustic plays a role in that, and, as ever, the hall’s distinctive aural character is well conveyed by the Polyhymnia recording team. 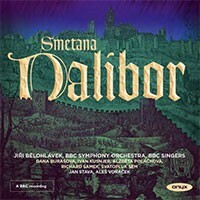 A standout release, then, among Jansons’ many recent offerings, and a version that does full justice to the work. The German Requiem is hardly a rarity on disc, but this recording has a fair claim to being the finest since Klemperer, a version with which it shares many key qualities.